This renal panel test checks markers related to renal function in the blood. What is tested in this renal blood panel? The renal function panel tests the albumin, calcium, carbon dioxide, chloride, creatinine, glucose, phosphate (as phosphorus), potassium, sodium and blood urea nitrogen (BUN) blood levels. Why is the renal function panel important? This renal test panel is important as it provides a detailed assessment of kidney function and kidney health. This Renal Function Test Panel is a blood test. The renal function test panel, also known as a renal blood test, kidney blood test, kidney panel, kidney function test and RFP lab test, measures renal function blood markers. Renal function refers to the overall health and performance of the kidneys. Humans have two kidneys and these organs are vital for clearing out waste products and excess fluids from the body through the urine. Composed of smaller components called nephrons, the kidneys have an intricate filtration system to help regulate fluid and electrolyte balance in the body. This particular renal function builds on the creatinine test by including the basic metabolic panel, the albumin level, and the phosphorus test. To get a renal function panel test near you, just order online and get your blood drawn at the Quest Diagnostics lab. Once your renal function lab report is ready, it will be available for download. 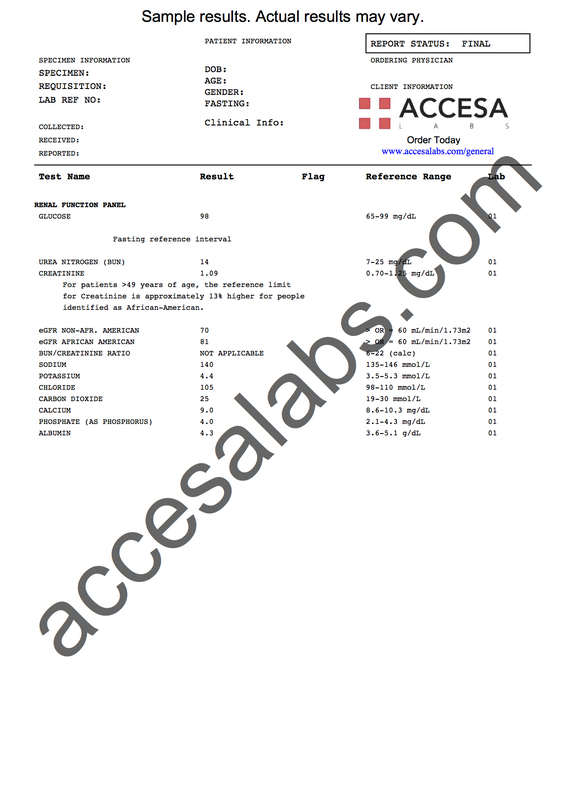 As can be seen on the sample renal function lab results above, the kidney function and other blood marker levels are reported as numbers which can be compared against the reference ranges provided by the lab. Renal Function Test Panel at Guaranteed Prices.